it's october, and for me that means everything pumpkin. (pumpkin spice lattes are back at starbucks--yahoo!) in honor of this magical orange fruit (am i the only one who thought it was a veggie?!) we will be posting our favorite pumpkin recipes for mmmmm, mondays this month. 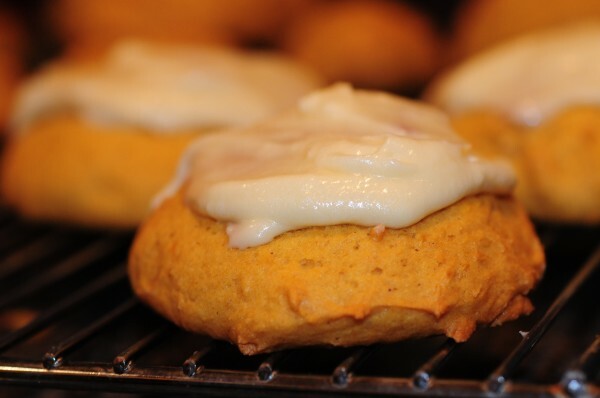 we are kicking it off with my *favorite* frosted pumpkin cookies. they are cake-like and just delightful. enjoy! cream together shortening, sugar, and pumpkin. then add in the egg, flour, baking soda, cinnamon, salt, raisins, all spice, and ginger. drop from a spoon to cookie sheet. cook milk, butter, and brown sugar until dissolved. cool and add powdered sugar and vanilla.